I ran into a humble looking Jambite in Ibadan last week, I asked him how many times he had written JAMB, he smiled and replied; once sir. I quizzed him further on what school he had applied for on his first attempt, he replied OAU sir. Then what are you still doing at home? That was when he told me about how he sat for the wrong subjects in his jamb and subsequently got disqualified for admission in his preferred course of choice. All this happened due to poor information or miss-information prior to registering of Jamb and post-utme. Tolu’s predicament can befall anyone who isn’t very watchful and inquisitive with regards their school of choice. From Tolu’s story above you might have noticed that Jambite are always reluctant to search for information regarding their preferred school of choice, when and what they need to successfully get admitted into the institution. So my candid advice is that candidates should source for all the credible info they can get with regards their school of choice. Aspirants should bookmark the OAU website at www.oauife.edu.ng and visit this site for info from time to time. Islamic Studies English language, literature in English, IRS language and any other 2 social science subject Literature in English, either Arabic or Islamic Religious Knowledge and any other social science subject. History and Strategic Studies English language, literature in English, government and any other 2 social science subject Literature, government and any other social science subject. InternationalRelations English language, literature in English, and any other 3 social science subject Literature in English, government and any other social science subject. Institute of Education English, maths, literature in English, and any other 2 social science subject Literature in English, government and any other social science subject. Family, Nutrition and Consumer Sciences Maths, English, Biology and any other Two social, science or art subjects. Biology, and any other 2 social or science subject. Like most top schools in the country the Obafemi Awolowo University conducts her post-utme screening between August and September of every year and only aspirants who scored 200 and above and also chose OAU as institution of first choice in Jamb are invited. 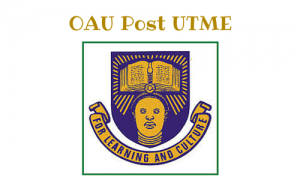 OAU carries out computer based testing (CBT) for her post UTME Screening. Candidate are to log on to www.oauife.edu.ng and complete their post-UTME registration.